On Christmas Eve in 1863 Mary Wade, mother of Jennie Wade, was still having trouble coping with the sudden los of her daughter during the Battle of Gettysburg. As the only civilian casualty of the battle, Jennie’s death was particularly heartbreaking to her family. In this tour, Mary recounts the tragic tale for you as she painfully tries to make sense of what has happened, and why. She will guide you through the home, just as the family traversed the halls, and eventually lead you through to the cellar, where Jennie’s body lay while the war raged on outside. This tour will take place every Saturday night in December at 5:00 pm, and tickets cost $15 per person. 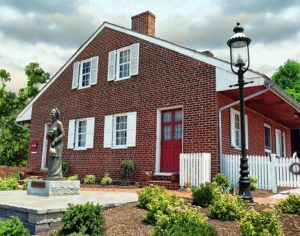 The Jennie Wade house will then be closed through January and February, reopening in mid-March. For more information or to buy tickets online, click here! The bright, sparkling portrayal of Christmas that we’ve all come to know and love has a dark side, and we want you to come experience it. Featuring folklore, legends, and history surrounding the villains of Christmastime – Krampus, Belsnickel, Hans Trapp, and many others – this tour is sure to pique any history enthusiast’s interest. Setting the stage in the darkened assembly room within the haunted orphanage, a Ghostly Images guide will recount tales of “Haunted” Christmas legends brought to America from Germany, Italy, England, France, and all across Europe dating back centuries. Parental discretion is advised for this tour, and the cost is $15 per person. For more information or to buy tickets online, click here! Of course, our regularly scheduled bus tours and walking tours are still in effect all season long, weather permitting. Take a stroll around the historic battlefield or pay one of our other historic homes a visit. With so much to do and see in Gettysburg, it’s the perfect way to spend a winter weekend! Our regular ghost tour options are still available through November 24th! Too late for our standard ghost tours? Our 2 Christmas-themed ghost tours will run every Saturday through December* (Note* ‘The Dark Side of Christmas’ ends December 22)! Click here for more information or to purchase tickets! Gettysburg Battlefield Tours are a great option for kids and adults alike. For more information about the tours that we offer or to buy your tickets, give us a call at 877-680-TOUR (8687) or visit us at www.gettysburgbattlefieldtours.com. We look forward to seeing you there!